The Alps are the highest mountain range of Europe and the most populated highlands of the world. The study region is located in the central Alps. Mean climate conditions were analyzed and mapped for the 30 year reference period extending from 1.1.1981 to 31.12.2010. 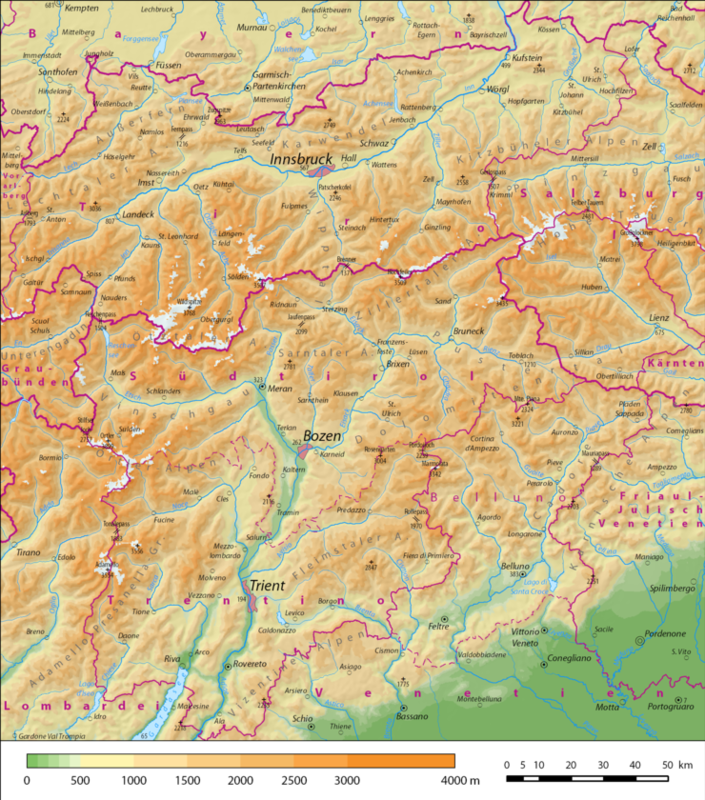 The spatial analysis climate maps include all parts of the Alpine region of Tyrol (Figures 1 and 2): North and East Tyrol which comprise the Austrian province of Tyrol, as well as South Tyrol and Trentino which belong to Italy. The Venetian province of Belluno which is completely covered by the resulting map area is also included in the climate analysis. The total investigated region covers an area of 30,000 km and extends both in north-south and west-east directions over some 225 km. Almost two million people live in this mountain region. The collection of climate maps thus involves one sixth of the total Alpine area and one seventh of the Alpine population. Fig. 1: Togographical overview of the investigated region. Fig. 2: Locations of regions, mountain ranges and valleys. Tyrol and its surrounding regions are inevitably connected to the high mountain relief. The topography affects climate conditions in many ways and subsequently the configuration and distribution of landscapes, bodies of water and settlements. On a continental scale the Alps are located at the intersection region for various types of air masses: humid, moderate influences from the Atlantic northwest; dry influences from the continental East which typically experiences cold winters and warm summers; and warm influences from the Mediterranean South typified by humid winters and dry summers. In order to reach the Alps by the shortest distance, maritime air masses would travel 850 km from the Bay of Biscay, 650 km from the North Sea, 190 km from the Ligurian Sea and only 60 km from the Adriatic Sea. The Alpine terrain prevents approaching air masses from advancing straight forward and redirects them. The most well-known modification of weather and climate by mountainous terrain results in the dry and warm downslope windstorms known as föhn. The main Alpine crest is often recognized as direct border between the different air masses. However, upstream ranges of the Northern and the Southern Alps play a similar role. Centered in the Alps and surrounded by high mountain ranges in all direction, the Vinschgau is, for the most part, effectively sheltered from incoming humid air masses. It is not surprising that one of the driest regions of the Alps is found here. The topography of the investigated region includes the widest North-South portion of the Alps, at up to 240 km. The vertical extension of the analysed region is also impressive. The deep valley of the Sarca River flows at an elevation of only 65 m into Lake Garda, while the Ortler towers 3899 m above mean sea level. Half of the total area lies at elevations between 1000 and 2000 m, only one fifth is lower, hence 30 % of the area are even higher. The mean elevation is 1620 m. Furthermore, the inclination of the slope with an area weighted average of 23 % provides the highland character of the investigated region. Only 5 % of the total area is flat (with an inclination of less than 3°). Thus the values of relative relief („relief energy“) is accordingly high: the height difference within a circuit of 3 km reaches 1380 m on average. Landscape, slope inclination and aspect crucially influence the radiation climate. Air which cools due to nocturnal radiation becomes more dense, flows downhill and accumulates in valleys and basins where pools of cold air form. On the other hand, there is an extraordinarily high radiation advantage on south faced slopes where (depending on the season) oblique sun rays intersect the ground perpendicularly. The near-surface warm air parcels become buoyant, rise, and develop summertime cumulus clouds which form preferentially along mountain chains rather than over lowlands and valleys. The main axes of human settlement lie along the Inn valley in the north and the Etsch valley in the south. Furthermore, there are the Drava in East Tyrol and the Piave in the Belluno province. While the Inn and Drava flow via the Danube River to the Black Sea, the Etsch and Piave, as well as the Chiese, Sarca and Brenta discharge into the Adriatic Sea. The continental divide extends from west along the main Alpine crest, but turns at the High Tauern to the south, traverses the Pustertal at the Toblach field and continues through the Sexten Dolomites towards the Carnic Alps to the east. Tiny regions at the border of Vorarlberg even belong to the Rhine drainage and thus flow to the North Sea. Lake Garda which is partly in Trentino territory, is the largest lake in Italy and the only large inland water body in the investigated region. The heat stored in the water has a damping influence on air temperature in the vicinity of the lake. The Lago di Santa Croce and Lake Reschen are much smaller reservoirs and were primarily built for hydropower reasons. Similar to the hydrology of the region, the land cover is also not in its natural, unmodified state. Continuous land usage changes since medieval times has diminished forests and increased agricultural areas causing changes in albedo (surface reflectivity), evaporation rate and surface roughness, all of which are relevant to climate. According to the current inventory there are 857 glaciers in the region (without Trentino) having a total area of 412 km². Approximately three-quarters of the total glaciated area lies within Austrian territory. Furthermore, the heat-island effect of large cities also affects climate and is mainly caused by enhanced heating of buildings and constructed works relative to natural landscapes as well as diminished evaporative cooling due to reduced vegetation. The investigated area includes Innsbruck, Trient and Bozen, each of which is home to more than 100,000 inhabitants. Curiously, there is a large gap of medium size cities in the total region, only followed by the rather small towns of Rovereto, Meran and Belluno. The Alpine climate in Tyrol and the Belluno province varies greatly within a relatively small area as it includes the cold and humid cryospheric (ice) climate of glacier regions, subtropical characteristics of the southern valleys, warm and dry föhn, cold air pools, precipitation enhancement along mountain barriers, sheltered dry regions, snow masses and sun-kissed spots. An exhaustive analysis of this extraordinary variety is impossible. Nevertheless, the choice of available climate maps provides a bounty of information and insights into a wide range of the most important climate aspects in this region. For details on the method of the creation of climate maps please see here. The temperature of the near-surface atmosphere is the most regarded parameter in climatology. It fundamentally controls all ecological issues and crucially influences the heat balance of every living organism. The air temperature is a measure of the kinetic energy of air molecules. The (average climatological) decrease with increasing elevation results from decreasing air pressure. Within the mountainous 3PCLIM-region the spatial temperature distribution is thus mainly moulded by elevation. This is superimposed by specific terrain induced climatological features like cold air pools, influences of lakes and föhn as well as urban heat islands. The air temperature is regulated by the radiation balance of the earth's surface with according diurnal and seasonal variations. Due to the heat storage capacity of the soil, daily or annual extreme values are delayed relative to the according radiation extrema by several hours or weeks. Furthermore, there are natural and anthropological induced long-term variations in air temperature (cf. Variability and trends between Arlberg and the Dolomites). The following analyses are based on daily temperature averages calculated by the arithmetic mean of morning (7 a.m.), evening (7 p.m.), minimum and maximum observations. Different regional conventions for calculating daily temperatures in Switzerland, Germany and Italy have been adjusted to this averaging method. The mean annual air temperature is the most generalised representation of temperature climate conditions (map Temperature :: total mean). Considering the populous valleys the mean annual air temperature ranges between 7 and 9 °C north of and 9 and 12 °C south of the main Alpine crest. Whereas the warmest spots (13 °C) are found on the northern banks of Lake Garda, villages located in high valleys report mean annual temperatures of only 2 °C. The zero-degree isotherm roughly varies between 2300 and 2600 m a.s.l. from north to south. At the summit of the Ortler (3899 m) the average annual temperature is estimated to be as low as –9 °C. The spatial mean over the study region is 4 °C. The annual variation of the air temperature reveals large spatial differences (maps Temperature :: monthly mean). With a spatial average of –4 °C January is the coldest month of the year. Temperature is more unsystematically distributed over elevation than in any other month. Inner-Alpine locations like the Defereggen (–8 °C), the Val Badia (–7 °C) and the Paznaun (–6 °C) are bitingly cold with frequent formation of valley-scale inversion layers. Depending on valley size, orientation, and solar gain, temperature differs largely even between close-by valleys. Whereas mean temperatures remain below 0 °C throughout areas north of the main Alpine crest, they fluctuate around the freezing point in the Etschtal and the southern part of the Province of Belluno. The mildest area is the Sarca Valley with average temperatures of up to 3 °C. The high-Alpine summit regions have monthly mean temperatures as low as –15 °C. Thus, January temperatures span the rather small range of 18 °C across the entire region. In the region as a whole February is a little warmer than January, but above around 1800 m February is even slightly colder (down to –16 °C on the Ortler peak). In March the vertical temperature distribution becomes much less disturbed by valley-scale inversion layers. In April warming proceeds quickly in the lowlands, whereas higher elevations follow only slowly. Above around 2000 m a.s.l. frost still prevails, and on top of the Ortler –11 °C is typical for mid-spring. The reason is the thick snow cover at higher elevations at this time of year, which reflects a large fraction of incoming solar radiation. In the low-lying cities the mean April temperature reaches values of 8 °C (Lienz, 661 m), 10 °C (Innsbruck, 579 m, and Belluno, 376 m) or 12 °C (Bozen, 254 m). Trento (194 m) is even slightly warmer (13 °C). 2 °C is a representative value for the overall region. The strongest month-to-month warming occurs from April to May. As the high solar altitude causes effective vertical mixing of the lower atmosphere, June has the closest connection between temperature pattern and topography. July is the warmest month of the year with an area average of 13 °C. At the same time the range between the coldest (Ortler summit: –2 °C) and the hottest (Lower Sarca Valley: 24 °C) locations of the study region is largest, spanning almost 26 °C. The mean frost line is located around 3600 m a.s.l. Accordingly, high mountain regions are still markedly colder in mid-summer than the warmest areas of the study region are in mid-winter. 17 to 19 °C are representative temperature values for the main valleys of North and East Tyrol, 21 to 23 °C for the main valleys of South Tyrol, Trentino and Belluno. August features a very similar temperature pattern as July, the late summer month is only slightly cooler in the valleys. From August to September mean temperatures drop from 13° to 9° C across the study region. Autumn cooling proceeds more quickly in the valleys than on the mountains. In October the mean frost line is at 2700 m a.s.l., much higher than in mid-spring. On the highest summits October temperatures vary around –8 °C. The monthly mean temperature takes values below 10 °C in the entire Inn Valley, the Vinschgau, the Pustertal and the Cadore. From Meran (330 m), Klausen (700 m) and Perarolo di Cadore (532 m) downstream monthly mean temperatures of 10 to 12 °C are reached, topping at almost 14 °C in Arco (91 m). Seasonal cooling is most effective from October to November. Longer nights, frequent high-pressure conditions and a generally lower temperature level promote the sinking of cooling air masses and the formation of cold-air pools. Thus mean November temperatures already drop below the freezing point in higher valleys like the Paznaun, the Seefeld Plateau, the Defereggen, the Toblacher Feld and the Val Badia. On the other hand Lake Garda has a warming influence on areas near its northern bank where average temperatures of up to 8 °C are recorded. The temperature pattern gets even more scattered in December. The decrease of temperature towards mid-elevations is weak, only above about 2000 m a.s.l. temperature drops significantly. The mean annual minimum or maximum of air temperature is calculated from the 30 annual minimum or maximum temperatures of the study period. Hence in single years even lower or higher temperatures were recorded. For large parts of North and East Tyrol, the upper Vinschgau, the Pustertal and the interior Dolomite valleys –18 to –16 °C is the average coldest annual temperature (map Temperature :: mean of yearly minimum). Less cold spots are the city of Innsbruck and the Inn bend near Landeck. Even colder spots are e.g. Alta Badia (–21 °C), the Paznaun (–22 °C) and the Defereggen (–23 °C) which is the coldest valley of the region. The Achen Valley is the only location below 1000 m a.s.l. recording less than –20 °C on average. On the mountains such values are found only above around 2200 m a.s.l. On the Ortler summit –30 °C is likely to be reached on a regular basis. The coldness abruptly diminishes from Schlanders (698 m) and Franzensfeste (725 m) downstream: –12 to –9 °C are usual annual minima for the southern main valleys and up to –6 °C directly on the shore of Lake Garda. In many valleys of the study region including the Inn Valley, the Vinschgau, the Eisacktal, the Lienz Basin and the Valbelluna the highest temperature of the year is usually 32 to 34 °C (map Temperature :: mean of yearly maximum). Mean annual maxima decrease uniformly with increasing elevation, down to about 23 °C in the highest valleys at around 2000 m a.s.l. Pass locations at a similar elevation are one to two degrees cooler. Positive temperatures are clearly reached even on the highest summits every year, e.g. 7 °C on the Ortler. Typical annual maxima are 35 to 36 °C in the Etschtal with 36 °C as far upstream as Meran. The hot spot is the city of Bozen where 37 °C is commonly reached. Based on thresholds, sums and differences various additional temperature climate parameters are derived to address specific issues. The annual number of ice days counts days when the maximum temperature remains below 0 °C. It varies largely over the study region (map Temperature :: ice days): in the Lower Sarca Valley an ice day occurs less than once per year (actually as rarely as once in five to ten years). However up to more than three-quarters of the year are usually characterised by permanent frost at the highest summits. The contrast between the colder valleys of North and East Tyrol and the warmer southern valleys is obvious. Remarkable is the strong gradient at the transition from the persistently cold Pustertal (up to seven weeks of ice days) to the thermally favoured Eisacktal (about one week of ice days). The annual number of summer days is the sum of days having a maximum temperature of 25 °C or higher. 50 to 60 summer days are recorded in the average year in the Inn Valley and the Lienz Basin (map Temperature :: summer days). In the Vinschgau, the Eisacktal, the Sugana Valley and the Valbelluna temperatures of more than 25 °C are usually reached on 60 to 90 days per year. As many as 100 to 125 summer days are common along the Etsch between Meran and Rovereto, only topped by Arco in the Lower Sarca Valley. At higher elevations the number of summer days is characterised by local influences like slope orientation or a valley’s air volume. At about 1500 m a.s.l. the number ranges between 1 and 20 days. The upper boundary of summer days is found at around 2000 m a.s.l. but differs largely by region. Days when air temperature passes the freezing point are classified as freeze-thaw days. On such days, the minimum temperature is below and the maximum temperature is above 0 °C. The annual count of freeze-thaw days provides more meaningful information concerning the intensity of frost weathering of bedrock and technical constructions than the quantity of permanent frost days (ice days). The spatial pattern of the number of freeze-thaw days exhibits a complex interference of elevation and inversion effects (map Temperature :: freeze-thaw days). Where frost occurs generally less frequently, such as in the Lower Inn Valley, the Etschtal and Valbelluna, the number of freeze-thaw days is low as well. The same is true for high-Alpine regions, but here this is due to the fact that temperature remains below zero on most days. Mid-elevations and especially higher-lying inner-Alpine valleys show the largest numbers of freeze-thaw-days. The maximum is found in the Fassa Valley. The degree-day number is made up of the individual daily differences between indoor temperature (defined as 20 °C) and the daily mean (outdoor) temperature, accumulated throughout the year. Only heating days with a daily mean (outdoor) temperature of less than 12 °C are taken into calculation. The annual degree-day number is therefore a measure of the heating demand during the heating season. The spatial distribution of the degree-day number is closely connected to elevation (map Temperature :: degree-day number). In addition its level is generally a little higher in the northern than in the southern part of the region. Values range between around 2500 °C in the Etschtal, 3000 °C in the Valbelluna, 3500 °C in the Inn Valley and 4000 °C in the Lienz Basin. Mountain huts at 2000 m a.s.l. have an annual heating demand of about 6000 °C. At 3000 m the degree-day number totals about 8500 °C. The growing season denotes that period of year when most plants are photosynthetically active, when they grow, bloom and fruit. The growing season according to the five-degree threshold spans the longest continuous episode of days with a temperature mean of 5 °C or higher. However, any earlier or later episode of warm days is included in the growing season if it lasts longer than the sum of all intermediate cooler days. The five-degree threshold has general agricultural significance and is associated with an evident increase of plant growth rates. The spatial distributions of duration, start and end of this growing season are shown in the maps Temperature :: growing season t ≥ 5°C. Along the Etsch between Avio and Meran the vegetation period according to the five-degree threshold usually starts by the end of February. Over the course of March the growing season begins in most lowlands of the study region. In the Außerfern, the Leukental, the Pustertal and the Valle del Boite it takes until April. In May, June and July the onset of the vegetation period continues to elevations of around 1700, 2300 and 2800 m a.s.l., respectively, but these mean elevations cover large north-to-south differences. The ending of the vegetation period usually occurs at elevations of around 2700 m in August and at around 2200 m a.s.l. in September. During the second half of October the vegetation period ends in the first lowlands, namely the Außerfern, the Wipptal and the Pustertal. In the Etschtal below Meran, the Sugana Valley and the Valbelluna it lasts until the second half of November. In the Lower Sarca Valley the vegetation period extends into the first days of December. Hence in the thermally favoured areas of the low-lying southern valleys about nine to ten months are annually available for the development of plants. The vegetation duration is about seven to more than eight months in the Inn Valley, the Lienz Basin and the Pustertal. Precipitation includes all condensed water from clouds and fog that reaches the earth's surface, either in liquid form such as rain and drizzle or in solid form such as snow, hail, ice pellets and graupel. Precipitation together with (potential) evaporation determines the climatological water balance. It influences the shape of aboveground drainage systems, the feasibility of hydropower utilization, the formation of groundwater, natural vegetation and farming. As precipitation varies enormously in space and time, the observation network for precipitation is the densest of all parameters. However, only 3 % of the measurements are recorded at elevations exceeding 2000 m, which form 30 % of the total area as mentioned above. (Precipitation analysis which are not based on daily values are slightly supplemented by data from accumulative rain gages.) Furthermore, the main observation problem, which is the loss by drift, is even more pronounced at high elevations due to stronger winds and the higher share of snowfall. There are two effects for all precipitation maps: first, the quality decreases with height until the values contain only order of magnitude information. Second, all analyses refer to measured precipitation amounts, whereas the actual precipitation sums are potentially higher. The annual precipitation sum per unit area (in litres per square metre) corresponds with the measured depth of precipitation (in mm) accumulated throughout the year on the long-term average. The general increase in precipitation towards higher elevation only partially explains the actual distribution pattern (map precipitation :: mean annual sum). Orographic lift of moist air masses causes considerably higher precipitation on the windward side of mountains, especially at the edge of the Alps, leaving drier air on the leeward föhn side, especially in inner-Alpine valleys. Accordingly the Northern Limestone Alps receive high amounts from westerly to northerly flows, as do the Southern Prealps from southerly flows. Most drastic is the abrupt gradient from the Allgäu Alps (about 2800 mm), where the region’s highest mean annual precipitation sums are recorded, to the Upper Inn Valley (about 700 m). The transition is much smoother across the Dolomites. The region’s driest valley, embedded in the middle of the Alps, is the Vinschgau (530 mm). Along the main Alpine crest the precipitation differs largely between the High Tauern, which gain much precipitation from both northerly and southerly flows, and the drier Ötztal Alps. The mean annual precipitation sum is 1300 mm on spatial average over the study region. The precipitation pattern described above is not fixed throughout the year, but varies (maps precipitation :: mean monthly sum). In January the study region receives about 65 mm of precipitation on average. The precipitation amount is, however, heavily differentiated over the area. Whereas up to 250 mm, mostly as snow, accumulate in the Northern Limestone Alps, the Southern Alps (except for the Vicentine Alps) receive generally low precipitation sums of about 40 to 80 mm. The same is true for parts of the Central Alps where January is the driest month of the year for the Stubai and Zillertal Alps. Marked dry areas are the valleys between Lake Reschen and Bozen and continuing to Toblach where less than 25 mm, in some places only 15 mm, of precipitation fall during the average January. February usually is the year’s driest month over the study region taken as a whole and in most of its parts. In March orographically induced precipitation from the north as well as from the south intensifies. In April (spatial average of 100 mm) the orographic precipitation from the south increases considerably, whereas precipitation amounts decrease somewhat over the Northern Limestone Alps. As a result the Ortler Alps, the Adamello-Presanella Alps and the Dolomites receive monthly precipitation amounts (about 70 to 200 mm) comparable to the northern mountain ranges between the Lechtal Alps and the Kaiser Mountains. 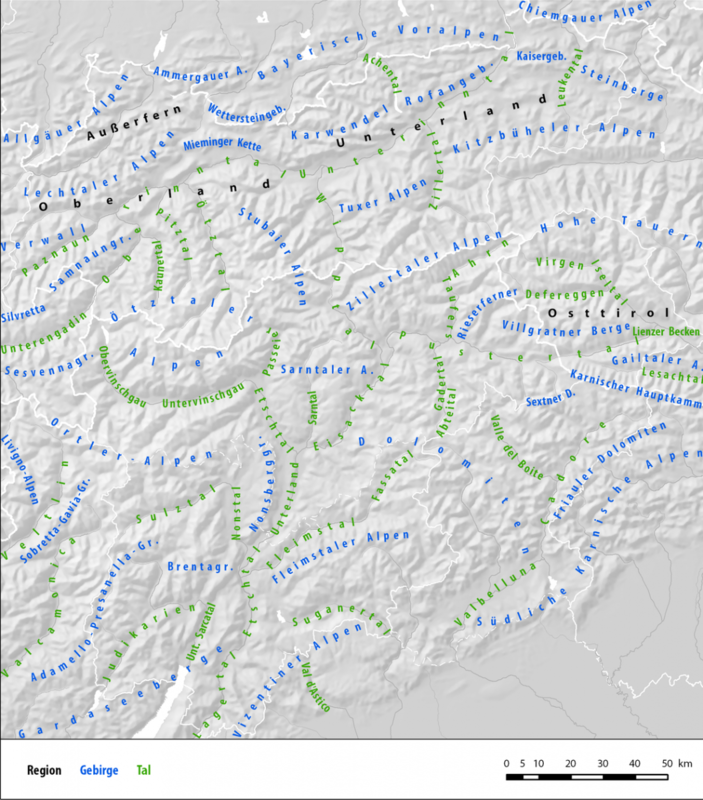 The Ötztal and Sarntal Alps remain much drier with monthly precipitation totals mostly below 100 mm. In the Außerfern and the Upper Inn Valley as well as in the Verwall and Silvretta Alps April is usually the driest month of the year. Regarding the valley floor of the Inn the average monthly sum diminishes by more than two thirds up the valley from the Bavarian to the Grisonian border. Regional extremes are distributed accordingly: 30 mm in the Upper Inn Valley, towards 300 mm at high levels of the Vicentine Alps. In May the contribution of precipitation caused by local convection grows, which is why inner-Alpine areas receive higher precipitation amounts. As a result the variability of May precipitation is (speaking in relative terms) spatially most balanced. The spatial average of precipitation continues to increase in June. This is due to intensified precipitation in the northern two-thirds of the study region, whereas south of the Vinschgau, the Fiemme Valley and the Valle del Boite the air starts to dry off under the growing influence of subtropical high-pressure areas. On average over the study region the warmest month of the year is also the wettest one. In detail, this is true over most areas north of and including the Vinschgau and the main Dolomite crest. July usually brings more than 150 mm on spatial average, which is almost three times the mean February sum. As the convective season culminates, amounts between 70 mm in the Vinschgau and well above 300 mm at summit level of the High Tauern accumulate. Farther south the precipitation amounts decrease in mid-summer but still amount to about 90 to 190 mm. In August precipitation totals remain at a generally high level. Towards September the average precipitation sums decrease with the exception of the southern Adamello and Vicentine Alps. In October, as the spatial average precipitation comes to 120 mm, contrasts become larger. On the one hand the influence of persistent autumn high-pressure areas grows as the continent cools. Thus precipitation amounts decrease to around 60 to 180 mm along the main Alpine crest and north of it, 45 mm in the extreme case of the Upper Inn Valley. October is even the average year’s driest month at higher elevations of the Northern Limestone Alps. On the other hand stable weather episodes are interrupted by distinct, slow-moving low-pressure systems from the warm waters of the Ligurian and the Adriatic Seas which bring sustained, intense precipitation especially in the Southern Prealps. Even on the long-term mean up to above 300 mm are likely to be reached at high elevations of the Vicentine Alps and also the southern valleys are affected by 150 to 220 mm. Consequently the area south of the line connecting the Ortler, the Sole Valley, Tramin, the Fleimstal Alps, the Marmolada and Sappada fit the criterion of Mediterranean precipitation climate: a primary monthly precipitation maximum not in summer, but in autumn. Compared to the pre-month average precipitation slightly decreases in November. This is true except for the Northern Limestone Alps and high-levels of the High Tauern where fronts from northern directions achieve an increase in precipitation. From the Adamello-Presanella Alps to the Carnic Prealps the influence of Mediterranean cyclones is still strong. In December areas south of the main Alpine crest become markedly drier, whereas precipitation sums continue to increase west and north of the Inn Valley and north of the Kitzbühel Alps. The annual number of rainy days is the total number of days with a precipitation sum of 1 mm or more throughout the year. Most rainy days are recorded in the Northern Alps due to orographic precipitation (map precipitation :: days with precipitation ≥ 1mm). Rain or snow falls on up to 180 days per year at summit levels from the Allgäu Alps via the Karwendel to the Kitzbühel Alps. Similar values are found directly at the main Alpine crest of the High Tauern which receives precipitation from both the north and south. Around 160 and 130 days is typical for the Adamello-Presanella and the Ötztal Alps respectively. More episodic is the temporal precipitation distribution over the Dolomites with around 120 days. Precipitation occurs least often in the Upper Vinschgau where only 70 days with at least 1 mm of precipitation happen throughout the average year. The spatial average over the study region is 125 days. The mean duration of dry periods refers to the mean time interval between two precipitation days with a precipitation sum of at least 1 mm. In the main valleys south of the main Alpine crest a mean of 5 to 7 days elapses between two precipitation events (map precipitation :: mean duration dry period). In the northern valleys the mean duration of dry periods is 3.5 to 5 days. In general there is a slight reduction in mean dry period duration towards higher elevations. It is shortest at high levels of the Northern Limestone Alps and the High Tauern where it decreases to around 3 days. The spatial average of the mean duration of dry periods is 4.5 days. The mean annual maximum of daily precipitation is the long-term average of the largest daily precipitation amounts from each year. It thus reveals the wettest day of each year. The 24-hour precipitation maximum usually brings between 50 and 70 mm for most of the study region (map precipitation :: mean annual maximum daily sum). Thunderstorms are mostly responsible for that. However the influence of low-pressure systems from the Adriatic Sea becomes obvious in terms of a gradual increase towards the southeast. The Vicentine Alps, the Valbelluna and the Carnic Prealps are affected by maximum daily precipitation sums of 90 to 180 mm across all elevations. The spatial minimum is primarily found in the Ötztal where less than 40 mm mark the average year’s most intense precipitation day. The spatial average amounts to 70 mm. The 30-year return level of three-day precipitation is the 72-hour precipitation sum that has a statistical return period of 30 years. In order words, the given precipitation depth falling within three days is expected to occur at least once in 30 years. Strong three-day precipitation events may result in widespread flooding disasters with numerous mudslides. The 30-year event of three-day precipitation in most parts of the study region is around 140 to 210 mm (map precipitation :: extreme values 3-days sum :: return time 30 years). However, these values are largely not reached in the central Alpine valleys. About 90 mm are typical locally in the Upper Inn Valley and the Pustertal. Around 180 to 300 mm are found at higher elevations apart from the Ötzal, Stubai and Sarntal Alps. Precipitation depths of up to 550 mm are found towards the Friulian Dolomites. 250 to 350 mm of precipitation within 3 days characterise the 30-year event even on the valley floor of Valbelluna. The fraction of precipitation which reaches the surface as snow during sufficiently cold temperatures contributes to the formation of snow cover. The existence of snow cover has substantial ecological and economic effects. Due to its high albedo, fresh snow reflects approximately 85 % of the incoming solar radiation which, therefore, cannot contribute to warming. Entrained air within the snow cover increases its thermal insulation effect. Thereby, the snow cover effectively protects seeds and parts of plants at the soil level from severe frost. Water buffered in the snow cover leads to a reduced run-off during winter and an increase during the snow melt with according effects on hydro-power use. Last but not least, snow cover is a pre-requisite for winter sports and tourism. In climatology a snow cover refers to a snow layer of at least 1 cm depth. Snow observation which usually occurs in the morning at 7 p.m. distinguishes between daily fresh snow depth and snow height (i.e. total snow height). However, very short-lived snow covers might not be detected by morning observations. Even more significant is that station density decreases with height similar to precipitation measurements. Due to the highly variable snow deposition in complex high-alpine terrain, as well as snow drift and transport by wind and avalanches, the presented values are a theoretical approximation to a spatially representative value of the surrounding area. Additionally, different regional conventions and discontinuous measurement series in the southern parts prevent a reasonable, high quality mapping of the snow climate across the entire study region. The annual sum of fresh-fallen snow accumulates the individual daily depths of fresh-fallen snow over the year. The actual degradation of the snow cover by settling, melting and evaporation of snow is disregarded. The pattern of the mean yearly sum of fresh-fallen snow is strongly dependent on the elevation (map fresh fallen snow :: mean yearly sum). However, with 3 to 6 m at elevations around 1000 m the Northern Alps get about three times as much as at similar elevations at the main Alpine crest. This is not only due to high-precipitation producing north-westerly flows, but also due to the fact that the associated air flows are relatively cold. In high mountain regions extreme amounts can even exceed 20 m. Apart from high mountains, the highest measured values occur in the Außerfern. Hahnenkamm (1670 m) near Reutte records mean values of roughly 11 m, and Hochfilzen (1000 m) a remarkable 6,8 m. Both Innsbruck and Lienz obtain 1,1 m on average. The spatial minimum is clearly located in the valleys of South Tyrol. Bozen records a yearly average of only 22 cm. The duration of snow cover comprises the period between the first and the last day of a year when a snow cover of at least 1 cm depth is measured in the morning (maps snow :: snow cover). Years are analysed from August to July instead of from January to December in order to avoid the splitting of natural snow seasons. The duration of snow cover may indeed include intermediate snow-free episodes. At similar elevations the first snow cover builds approximately two to three weeks earlier in the Northern than in the Southern Alps. It is the opposite with the last snow. At 2000 m winter onset is already possible in the Northern Alps during the first half of September, whereas in the Southern Alps only at the beginning of October. On the other hand, at this elevation the last snow cover melts around the summer solstice in the Northern Alps and at the beginning of June in the South. At 1000 m in the Northern Alps snow cover occurs between the end of October and the second week of April. In the Southern Alps this is only between mid-November and the beginning of April. In Innsbruck and Lienz the first snow cover forms around November 20th on average, while the last snow cover disappears towards beginning of April. In Bozen the snow cover is restricted on average to the eight weeks of the peak of winter between mid-December and the end of February. The mean monthly snow depth indicates the long-term average of the total snow depth at the middle (on the 15th) of the respective month (maps snow :: monthly mean). The mean monthly frequency of snow cover gives the long-term average number of days with a snow cover of at least 1 cm per month (maps snow cover :: mean frequency). In November the snow is relatively sparse at all elevations. On average in the large valleys there is little (Inntal, Pustertal) to no (Etschtal and Vinschgau) snow. In the mountains and higher elevated valleys winter has already arrived. During this season northwesterly weather systems typically lead to snow fall. A comparison of snow depths at 2000 m reveals that mean snow depth in the Northern Alps is about 30 cm, but only the half that at the main Alpine crest and in the Southern Alps. The average values are not reached each year. However, the snow cover frequency hints at the probability of snow cover occurrence. At low elevations of 500 m in the Northern Alps there are about six days with snow cover and only two days in inner-Alpine valleys and the Southern Alps. The increase of snow cover frequency with elevation is quite linear at the beginning of the snow season. At 1500 m snow is found in the Northern Alps on average 18 days and in the Southern Alps, 12 days. At higher elevations, the north-south differences diminish, and all regions above 2500 m are snow covered during almost all of November. Shortly before Christmas, in mid-December on average, winter also arrives in the lowest valleys. In Bozen, Meran and Brixen (569 m) the average snow depth is roughly 1 cm, in Innsbruck 4 cm and Lienz 13 cm. However, in Bozen and Meran there are only 6 days with a snow cover, and 9 days in Brixen. While these cities mostly have no snow during the Christmas month, in Innsbruck and Lienz with 15 and 18 days of snow cover, a white Christmas is more likely. In the mountains snow depths quickly increase. At 2000 m snow depths roughly double in the Northern Alps to 60 cm since November, in the Dolomites they even triple to 45 cm. Hence, during this season southwesterly flows also often lead to snow fall. Sheltered from both northwesterly and southwesterly flows, the least snow accumulates in Sarntal, Stubai and Ötztal Alps with approximately 35 cm. At the peak of winter in mid-January snow depth strongly increases with elevation. At 500 m snow depth is approximately 10 cm, at 1500 m 50 cm, and at 2500 m about 1,5 m on average. South of the main Alpine crest snow covers are a little less thick. Since northwesterly weather systems still prevail during this season, there are already 1,1 m of snow at Hahnenkamm near Reutte, while at the much higher Monte Piana (2265 m) in the Sexten Dolomites 67 cm are recorded on average. Though January is the snowiest month in general at lower elevations, in Bozen the mean snow depth does not exceed 1 cm. Here, only 8 days of snow cover are found, in Innsbruck 20 days and in Lienz 24 days. South of Bozen the frequency of snow cover slightly increases since the Alpine fringes often receive snow more than sheltered inner Alpine valleys and basins. At higher valleys and typical winter sports resorts snow is generally guaranteed during January. By mid-February mean depth and frequency of the snow cover already declines at low elevations. However at middle and high elevations snow cover has strongly increased, hence for the total area the largest snow depths are now reached. The regional average snow depth is roughly 15 cm at 500 m, around 35 cm at 1000 m and about 60 cm at 1500 m. However, regional differences are enormous. While mean snow depth at about 1000 m increases in the Kitzbühel Alps to 84 cm (Hochfilzen), it stagnates in the inner-Dolomite valleys with 8 cm (Lüsen, 981m). At Brenner (1445 m) snow height is 65 cm and on the top of the Zugspitze (2964 m) it is 2,8 m. The decrease of the number of days with snow cover is, compared to the preceding month, stronger in the Southern than in the Northern Alps. In Lienz 20 days in February with a snow cover are recorded on average, in Innsbruck 16 days, and in Bozen 5 days. In March spatial differences in snow distribution increase. While average snow depth declines at elevations below 2000 m sea level (e.g. to 52 cm at Brenner), there is a considerable increase at high mountains (e.g. at Zugspitze to 3,6 m). Thus, the spatial average is similarly high as during February in spite of the seasonal warming. In Bozen, Meran and Brixen there is almost no snow, but also in Innsbruck only 1 cm is found, in Lienz it is 6 cm. At 2000 m the most snow has accumulated in the Lechtal Alps (1,9 m on average), the Ortler and Sarntal Alps have only a third of that. Whereas low elevations have no snow in most of the years, snow cover probability is still high in the mountains. The isoline for a snow cover frequency of 50 % (i.e. 15 days per month) is at about 700 m mean sea level north of the main Alpine crest and at about 900 m in the south. In Bozen, Meran and Brixen only two days with snow cover are recorded, about seven days in Innsbruck and 11 days in Lienz. In April the differences grow further. While at low elevations snow cover is a rare exception and also at low mountains melting proceeds, snow depths at high mountains are even increasing. Mean snow height at Patscherkofel (2247 m) is 86 cm, at Zuspitze 3,8 m. The higher elevated winter sports resorts like Obergurgl (1938 m) and Kühtai (1970 m) are covered by thick snow with 62 and 119 cm, respectively. The strongest decrease is found in the Northern Alps between 1000 and 1500 m with an average loss of 30 cm since mid-March. Here, rain contributes considerably to snow melting and subsidence. Above approximately 1300 to 1600 m, a snow cover is more likely than its absence. At mid-elevations the transition from low to high snow cover frequency tightens. At regions above 2000 m snow is quasi guaranteed. At low elevations days with snow do not carry over from the melting old snow pack, but from fresh late winter snowfall. On average, in Innsbruck and Lienz a snow cover is recorded in April once per year. Parts of the Upper Inn Valley, the Passeier, and the main valleys of South Tyrol are usually totally snow-free. The annual number of days with fresh snow counts the days with a morning depth of fresh-fallen snow of 1 cm or more throughout the year. Its frequency depends first of all on the elevation. Considering the whole area an increase of 42 days per 1000 m elevation is observed. In absolute numbers this relates to 21 days of fresh fallen snow in valleys (500 m) and 105 days at 2500 m above sea level. Considering the spatial distribution, most days with fresh snow are recorded in areas where northerly or westerly flow is blocked and at the main Alpine crest (map fresh fallen snow :: days with fresh snow ≥ 1cm). Measurement sites showing more than 50 days of fresh fallen snow per year are, for example Achenkirch (904 m), Galtür (1587 m) and Obergurgl. However, also at mid-elevations in East and South Tyrol fresh snow is observed at 40 (Ridnaun, 1350 m) to 45 days (Obertilliach, 1400 m) on average. In Innsbruck snow cover increases during 23 days per year, in Lienz where snow fall is more episodic, a comparable amount of fresh snow gathers during only 15 days. On average fewer than ten days with fresh-fallen snow are found in the lower valleys of South Tyrol: for example, it is only 6 days in Bozen. The annual number of days with snow cover is the total days with a (total) morning snow depth of 1 cm or more throughout the year. It depends not only on how often and how much snow falls, but also on how long an existing snow cover can thermally persist. Favourable conditions are found in high Alpine regions and also in valleys and basins that capture cold air and develop thermal inversions. The least frequent snow covers are recorded in the low inner Alpine valleys of the Southern Alps, like in Bozen with snow cover for only 23 days per year on average (maps snow :: days with snowdepth ≥ 1 cm). In North Tyrol snow cover is found on around twice as many days or more with the minimum in the region of Telfs (618 m) with 53 days. Snow cover frequency increases quickly with elevation, namely by roughly 10 days per 100 m in all regions up to 1500 m and by 12 days per 100 m above 1500 m. On average there is snow cover for 190 days at 2000 m in the Southern Alps and 220 days in the Northern Alps. The mean annual maximum of snow depth is the long-term average of the largest total snow depth for each year from daily observations. In addition to an increase with elevation and a general decrease from north to south, its spatial distribution mainly features the contrast between snowy Alpine fringes and drier inner Alpine valleys (map snow :: mean of yearly maximum). The highest values are recorded where snow-producing weather systems frequently encounter the first Alpine ridges and temperatures allow for snow accumulation. Up to mid-elevation levels, these are primarily located in the northeastern parts of Tyrol and the Arlberg region. At 1000 m, the mean annual maximum ranges here from 70 to 105 cm, while it is only around 40 cm in the Ortler Alps and Dolomites. At 2000 m, roughly 2,2 m in the Northern Alps contrast with 1,3 m in the Southern Alps. The Ortler and Tauern also act as effective snow barriers at mountain top regions with maximum values of 6 to 7 m. At Arlberg 5 m are possible. The mean annual maximum of snow depth reaches 46 cm on average in Lienz, 30 cm in Innsbruck, and 8 cm in Bozen. The 30-year return level of three-day fresh-fallen snow is the 72-hour depth of fresh-fallen snow that has a statistical return period of 30 years. In other words, the given snow depth falling within three days is expected to occur at least once in 30 years. Extreme amounts of fresh snow have major implications on public life, obstruct the traffic and raise the danger of avalanches. The three-day sums of fresh snow increase on average by 50 cm for a difference in elevation of 1000 m (map fresh fallen snow :: extreme values 3-days sum :: return time 30 years). Below 2000 m elevation the Northern Alps receive the most fresh-fallen snow. Above that height similar extreme values are recorded at the northern and southern Alpine rim. This shows that intense precipitation events can occur on both sides of the main Alpine crest. Since air masses coming from northerly directions are colder, the potential for snow fall down to lower elevations is higher: hence the 30-year return level could exceed 1,5 m in St. Ulrich am Pillersee (870 m) and in Obertilliach. In Lienz, only 1,4 m are expected, while it is only half that in Innsbruck. In general, sheltered inner Alpine locations do not get that much snow in a three-day period as values less than 1 m are widespread. Between Meran and Bozen, but also around Brixen, 30 to 35 cm of three-day fresh-fallen snow is enough for a 30-year event.